Have I mentioned how much I love the internet crafting world? For instance, there is a spring top week going on and I really wanted to join. 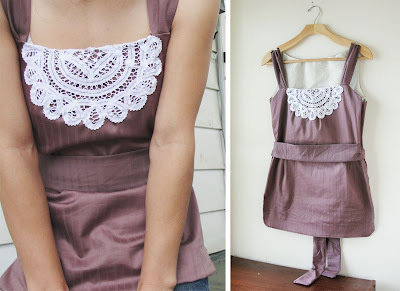 I also wanted a strapless mauve blouse to add to my somewhat lacking wardrobe. I wanted it to be practical (strong straps & covered shoulders) but I also wanted it to be girly & delicate. So naturally I sewed a doily onto it. Since the supplies to make it cost me under $5, I am very motivated to throw together some more. $5! That is awesome! Seriously this top looks like it would cost $60 or something at a fancy store! LJ, LJ, LJ---you amaze your Ma! I love this. LOVE it. It fits you so well too! What an adorable shirt Lili! I swear, every time I look at your blog I almost wish I had drug (dragged?) my sewing machine to France with me. Almost. Found you through the contest page, just wanted to say that this top is fantastic! A great way to use a vintage doily! This is so lovely! Great fit, great colour, great doily. I also found your blog from the contest site--great work! Very stylish top and sweet design. Good luck with the win. I just love this! It is adorable! Did you use a pattern? Congratulations on winning Spring Top week! That is a lovely top! I just discovered your blog through Rae's and I love it. I'll be following along! Congrats on your win. It was well deserved! Congratulations!!! What is the main fabric, it's so pretty! Thank you so much, everyone! So exciting! Oh can you make tutorials for these awesome tops you have made? I am in love!!! This is beautiful! I am going to feature this at somedaycrafts.blogspot.com. Grab my "Featured" button. Hi! I came over from Made by Rae. I love this top!!! And all for $5?! That makes it so much better! It's gorgeous! Did you use a pattern? Did you use a pattern or do you have a tutorial for this top? I absolutely love this shirt and I would like to make one for myself. Would you be willing to share? Love the blog!